Blueberry Banana Bread-moist, sweet banana bread dotted with juicy blueberries! Enjoy a slice for breakfast, as a snack, or even dessert! 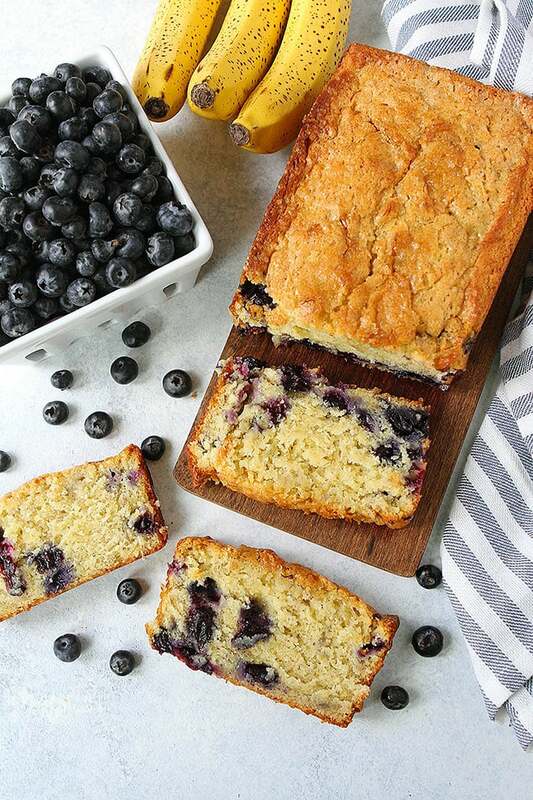 This banana bread recipe is a summer favorite when blueberries are in season! My favorite banana bread to bake in the summertime is this Blueberry Banana Bread. When blueberries are in season I love adding them to almost everything and they are SO good in this banana bread. You need to add baking blueberry banana bread to your summer bucket list ASAP! Brown bananas may not be the prettiest bananas but they are the best bananas for making banana bread. Over ripe bananas make the sweetest banana bread. Once they are mashed up and mixed into the batter, magic happens in the oven. Make sure you start with the ugliest, brown, mushy bananas you can find. If you don’t have any brown bananas, you can put your bananas in a brown paper bag and wait for them to turn brown…or you can call a neighbor or friend and ask if they have any. Sometimes grocery stores will give away brown bananas. You can also keep brown bananas in the freezer. You can see more of my banana bread tips here. This banana bread recipe is extra special because I gently fold blueberries into the batter. 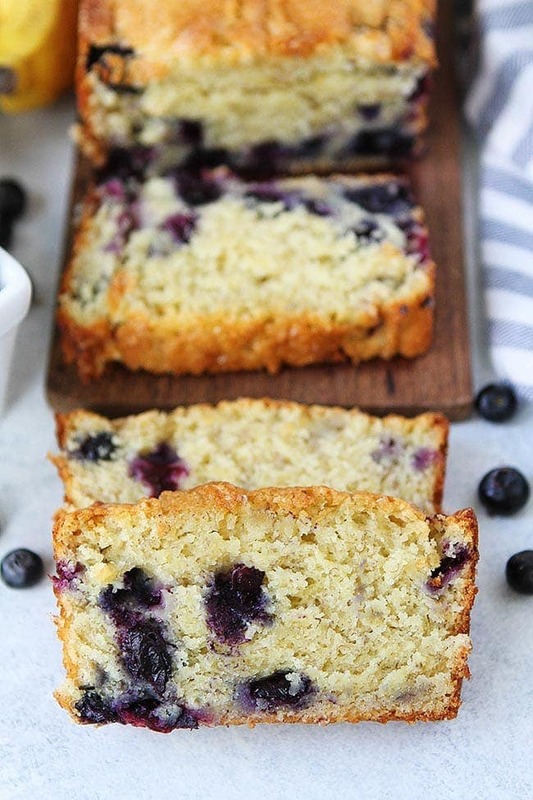 The blueberries are sweet, juicy, and add a burst of deliciousness in every slice. I love using fresh blueberries during the summer when they are in season and affordable. You can use frozen blueberries if you have them on hand, both will work. Pro tip, make sure you coat the blueberries, fresh or frozen, in a little bit of flour so they don’t sink to the bottom of the bread. 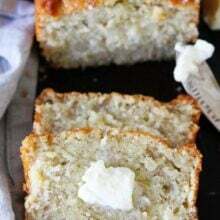 I love making banana bread because it is a quick bread. It doesn’t take much time or effort to make and the results are amazing. When the beautiful loaf comes out of the oven, it is hard to wait for a slice, but I promise the wait is worth it. You want to make sure the bread is cool to room temperature before slicing. 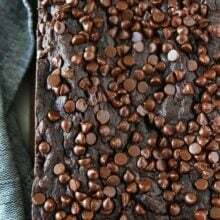 Once cooled, slice away and enjoy for breakfast, a snack, or even dessert. 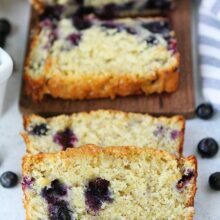 Let me tell you a little secret, this blueberry banana bread actually tastes more like cake instead of bread and that is a VERY good thing:) I sometimes serve a thick slice with whipped cream and extra blueberries for dessert and it is always a hit. 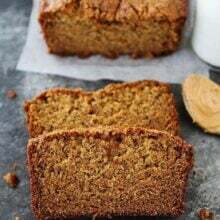 You are going to love this banana bread recipe no matter how you eat it! 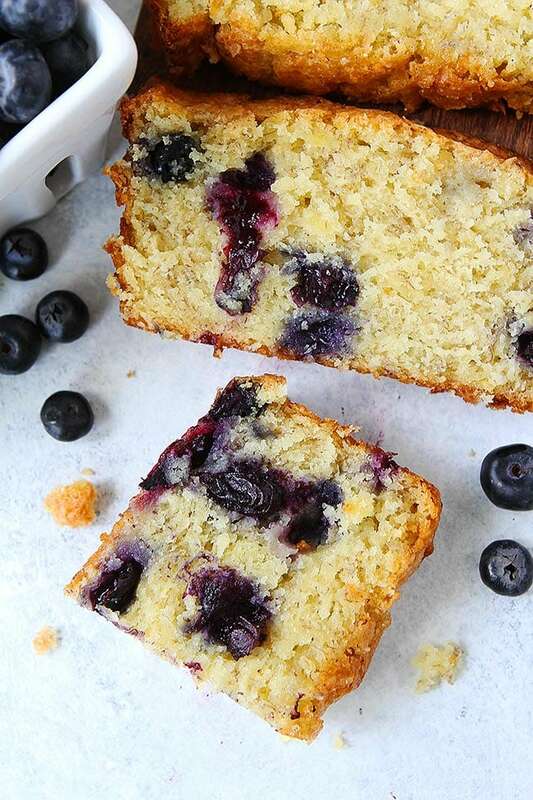 This banana bread is moist, sweet and dotted with juicy blueberries! Enjoy a slice for breakfast, as a snack, or even dessert! Preheat the oven to 350 degrees F. Grease a 9×5-inch loaf pan with nonstick cooking spray and set aside. In a medium bowl, whisk together the flour, baking powder, salt, and baking soda. Set aside. In the bowl of a stand mixer or by using a hand mixer, cream butter and sugar together. Add eggs, mashed bananas, buttermilk, and vanilla and mix until combined. Add the dry ingredients and mix until just combined. Don't over mix the batter. In a small bowl, combine the blueberries and 1 tablespoon flour. Toss until blueberries are well coated. Gently fold in the blueberries. Pour batter into prepared pan and sprinkle with turbinado sugar. Bake for 50-60 minutes or until a toothpick comes out clean in the center. Blueberries and banana are a great combo! I wonder how this would be made into muffins instead of loaves? Can’t wait to use my fresh blueberries to make this! Hi, what can I use as a substitute for buttermilk in this Blueberry Banana bread please. Also, do you use brown or white sugar? White sugar. You can try regular milk, I always use buttermilk. Or you can make buttermilk by adding lemon juice or vinegar to milk and let it sit for 5 minutes. 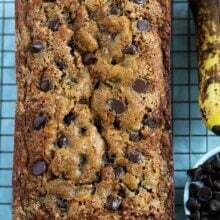 Looks really good, I love banana bread also! Yes, sorry about that. I updated the recipe. Have you ever used almond milk instead of buttermilk? Fabulously delicious, did not get a picture as it was half gone before I knew it!! Had to bake 10 minutes longer but maybe it was the type of glass pan I used, Corning Wear. Glad you loved the bread!